Go north, to Alaska; go north, the rush is on! With money literally lying on the ground, can you strike the mother-load and protect your interests in this ultimate symbol of the American dream? Or do you want to control the town and its commerce, preying on the misfortunate miners whose hopes die in the frozen Yukon mud? Either way, you’ll need all of your rugged frontierism and business savvy to succeed in this, the last great gold rush. The goal in Skagway is to wield the most influence, represented by points earned from both mining and controlling various parts of town. In fact, gold-digging is a rather minor (see what I did there) element (!) of this little nugget (eh?). The game has actually more to do with running the town itself, hence why its name graces the title, I suppose. To succeed in this cut-throat, border boomtown, you’ll need to channel your inner robber baron. Each turn, players alternate assigning their two workers to a number of spots around the settlement. After the placement phase, locations are resolved in a specific order, granting points and/or benefits to the players with workers there. You collect gold at the Mines. Working on the Railroad earns points for helping construct it, and grants ownership to the majority builder when completed. 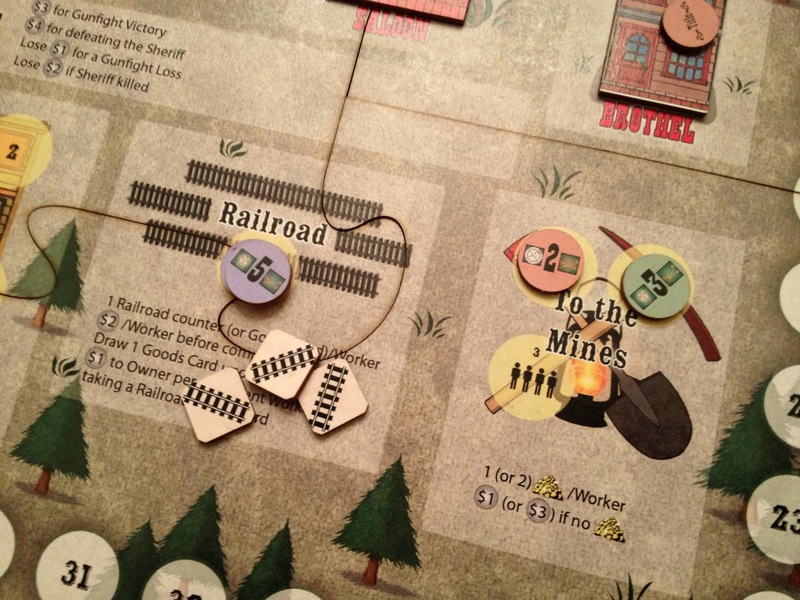 When it’s finished, players can then earn points for transporting goods into town, with a share going to the owner, of course. At the Mercantile & Assay Office you can deposit gold tokens in the bank for points and/or pay points to buy buildings. Three of these are common buildings which can switch ownership throughout play, while others are personal prestige buildings worth more points later. The Docks let you recruit a couple of temporary, hired hands to use next turn, but with some restrictions. 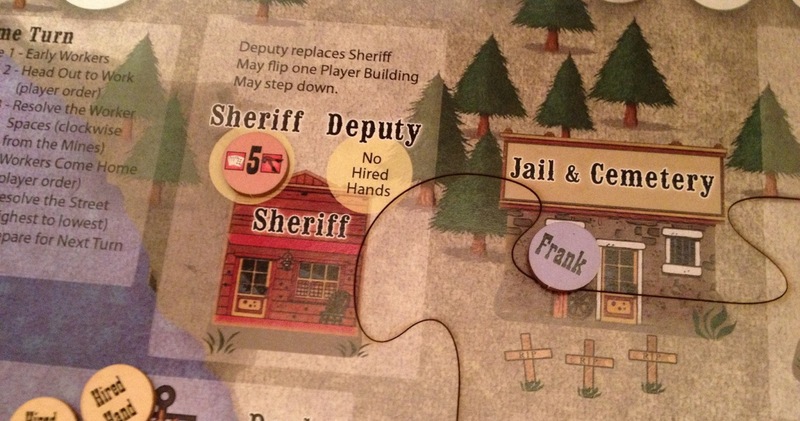 And serving as Sheriff grants you first-player status, as well as other manipulative abilities. The pedestrian, blue-collar spots. Place workers, take tokens, earn points. In addition to all of this standard worker-placement fare, Skagway includes another interesting phase of action and scoring in which your workers return to town after a hard day’s toil. There are four possible locations they may spend the evening. Three of these are the buildings mentioned above which players can purchase and will change ownership constantly as the game progresses. These establishments have a “good” and “bad” side – hotel/brothel, restaurant/saloon, and church/casino – which can be flipped over upon purchase, or not, depending on the buyer’s whim. Save your rants about moral relativism. Ownership can change every turn, but only once per turn. Each worker token designates that laborer’s primary and secondary leisure choices from among those six buildings. In this phase, workers go to their first preferential building or, if that is not available, then to their second druthers. If one of your hands ends up at a building that you don’t own, you must pay the owner points for the privilege of its services. Likewise, if you own a building, then its occupants will be paying you. 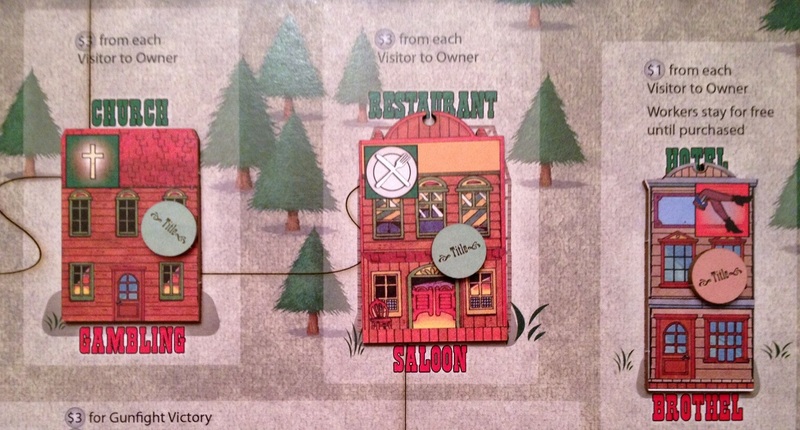 The three locations on the game board equal six possible buildings, good or bad. How will your town develop? If neither of a worker’s preferred hot spots are available, he/she winds up in the street – and we all know nothing good happens there. Each worker has a “gunfight” number which determines in what order they resolve actions and what their strength is in a…you guessed it…gunfight. Beginning with the highest numbered worker, players alternate taking mischievous actions that result in shootouts or bank robberies. 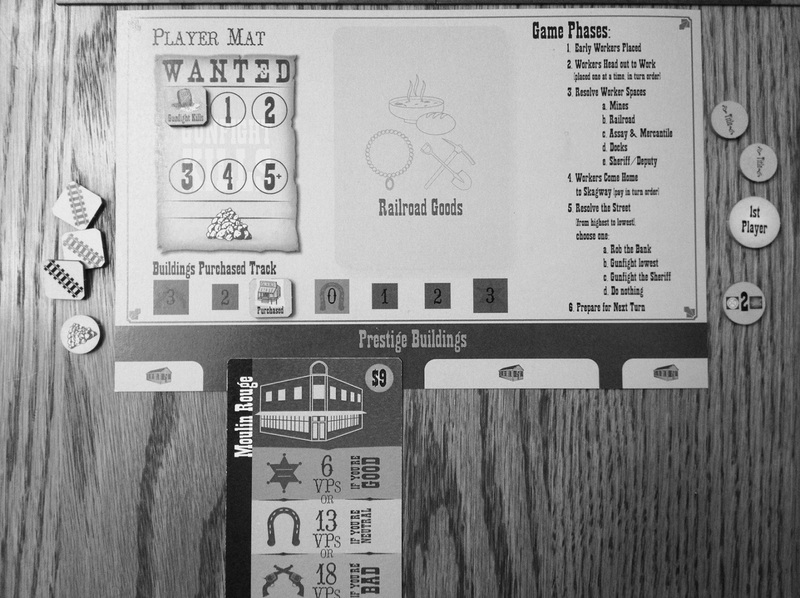 The quick earn points while the dead lose points and spend their next turn on Boot Hill in a pine box. 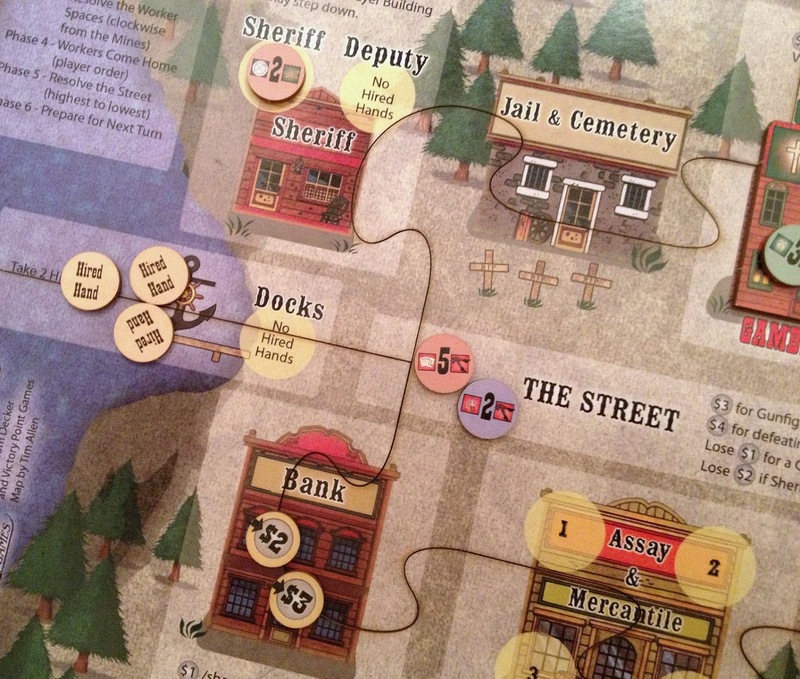 Making a run on the bank will typically involve a gang splitting the spoils, but watch out for the sheriff who can try to stop the heist, earning points and throwing thieves in jail, in which case they also lose their next turn. If you don’t want to risk a prison sentence, you can always challenge the lawman to a duel and be done with it! Of course, sometimes the better part of discretion is to just cool your heels and sleep it off – which is sort of a non-action action. The above synopsis is only a brief summary… with an emphasis on brief. The rules inSkagway can get a bit crunchy. There are location-specific details involved in resolving actions. Each spot awards, or penalizes, points in different ways and in various amounts. Additionally, some actions involve an exchange between players. All of these points are tallied on a running track around the board. Essentially, the game proceeds in this fashion until the gold mine runs dry. When that happens, the game continues for one final half-turn and then everyone adds more points to their current total based on what buildings they own and which parts of town they control. However, this endgame scoring is not so straight-forward. In another unique twist, points are decided by how the town has developed – and there are six possible outcomes. The final “state of Skagway” is determined by aggregating the number of times players bought and/or flipped the three “good/bad” (+/-) buildings, cross-referenced with how many total prestige buildings exist. Once the town’s status is calculated, you simply consult a scoring table in the rulebook. Individual buildings and other locations are worth different values based on how Skagwaydeveloped during play. You may have a good idea as to the town’s likely outcome, but jostling for the prime spots based on that is another matter. Is There Gold in Them There Hills? If you haven’t yet seen it, check out Universal Picture’s The Spoilers (1942) as soon as you can. As in right after reading this review, go rent it or find it online. Seriously. It’s a great flick, if somewhat chock-full of stereotypes! Pay attention, though, because there are five adaptations of this novel-to-screen story (a couple of them silent), so make sure you grab the ‘42 version with two of the greatest western actors of all time: John Wayne and Randolph Scott. The Spoilers is a rollicking, adventurous yarn set in the bustling hey-day of gold-feverNome,Alaska. There’s opulence and muck, tough guys and beauties, honest men and claim jumpers, humor, corruption, romance, action, violence, witty banter, a messy love triangle, and a massively over-the-top, six-minute-long saloon fight at the finale. Now you’re ready to playSkagway! Everyone who knew him growing up always figured Frank would end up in the clink one day. The theme shines surprisingly well in this design. While maybe not every individual action is 100% plausible or authentic, the overall game play evokes a sense of trying to tame the Wild West. It’s not so much about mining and building stuff, as a standard Euro might intimate, but rather mainly simulates the power struggles to control towns that sprang up around a gold rush. Sprouting overnight and developing with little organization, those boomtowns were nodes of bustling, swirling, lawless chaos. The hopeful and desperate dove straight into the bedlam with wide eyes, usually getting ground mercilessly into the very dust from which they sought their fortune. The shrewd and powerful cunningly tread into the miasma to manage it as best would line their pockets. The game’s seesaw battle between business ownership and political influence, coupled with shoot-outs and hold-ups, conveys this concept in a fun and fresh way. On the surface, Skagwaylooks straight-forward. The base mechanic is simple enough: place workers and resolve actions. Usually you will only have two workers each turn, which are placed in alternating rounds, and so the design minimizes downtime for the most part. However, beneath this surface of simplicity lies a deceptive depth. There are plenty of choices and each one matters. First, you only get to make a couple of decisions in a given turn, except for when you have temporary hired hands. So actions come at a premium and you better not waste them. Second, those choices interact with previous and future ones in cascading, cause-and-effect consequences. So your decisions affect not only your turn, but also other players’ turns, and your next turn, and then their next turns, and indeed the very course of the game by adding pieces to the town’s eventual outcome and final scoring! When the railroad is complete, you can ship goods (randomly) for points. There are many nuances in the way these choices might interact. For example, when gold is cashed in for points at the Mercantile, you could be adding to a fat pot of money ripe for a bank heist during the “Return to Town” phase. That is unless you turn in a $4 counter which clears out the entire bank’s deposits, returning those tokens to the mining supply and leaving workers who end up in the street with little to do but shoot at each other or talk about steers. I’m sure we all know which we’d prefer. Of course, if one of those possible street loiterers is in your employ, you may just want to leave all of that bullion in the vaults and share in the spoils of a robbery. Then again, if some other player is wearing the badge, you may forego the risk of riding herd with the gang, unless you want to try and bribe him with your creative entrepreneurship. And besides all that, other players may keep you entirely off the streets by purchasing and/or flipping leisure buildings. Hanging out in the street is not like cruising the main drag in the 1950’s. While the over-all design of Skagway keeps downtime to a minimum, there are a lot of details that may create some analysis-paralysis. Not only must you consider which spots to claim in the “Placement” phase, but its good to know how your actions there will affect individual workers in the “Return to Town” stage, because each one is different. Putting the right workers in the street at the most opportune time is also significant. Is there a lot of gold in the bank? Well, maybe having a low numbered worker is best as they’re least likely to get caught by the sheriff in a burglary. However, if the sheriff has a high number, it’s harder for him to nab the thieves, so maybe it’s worth the chance, after all? Then there’s the times when one player controls both sheriff and gang member, so the law looks the other way as they’re all in cahoots with one another. Often times, player order is important. Having those two extra temporary hands is a big boost, but only one player can work the Docks to get them. That means you’ll generally need to claim the Sheriff’s Office first, in order to grab first player status. A lot of the early game tends to be players trading terms as sheriff and using their first action to hire hands. Turn order is also influential in the streets as there are a few unfortunate ways to wind up in the cemetery or behind bars. With only two workers available in the majority of rounds, losing one for a turn can be very rough. Manipulating buildings to force certain scenarios in the “Return to Town” phase is a fun, brain-burning, if sometimes fruitless challenge. It’s really a mini-game in and of itself. Pull it off right and reap some nice rewards. Miss one detail and it can gloriously backfire in your face! But more than that, as everyone is trying to manage buildings for immediate rewards from turn to turn, the cumulative result helps to determineSkagway’s development. But you’re not always thinking about the “then” while considering the “now.” Therefore, it can be hard to predict which buildings will earn the most points and which locations are most beneficial to claim on the board. An old-time photo! Your player board tracks how many people you’ve killed and buildings purchased. Though some choices will prove sub-optimal, there are plenty of opportunities to control play. Yes, there is a fair amount of randomness. But really, most of it is created by the delicate web woven from player decisions. 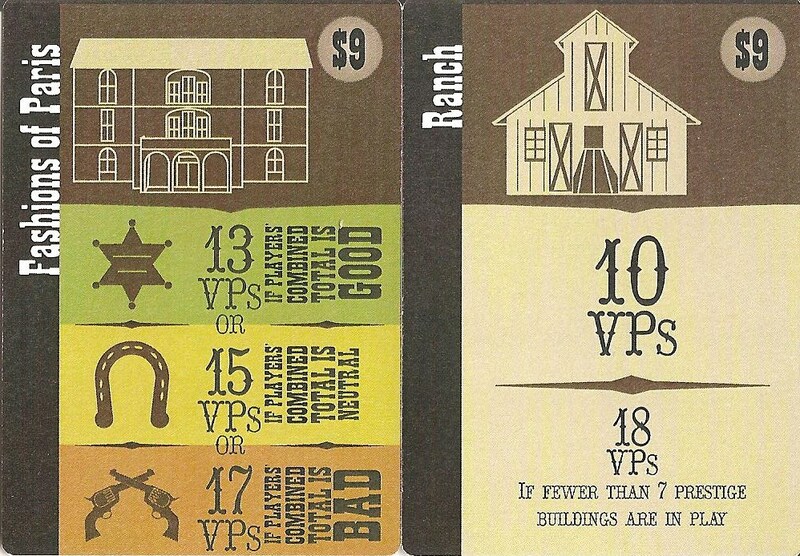 Since buildings are bought with points, even sometimes exchanged between players, the score is typically close with a lot of give-and-take. The interaction builds tension, creates some humorous narrative, and can be a good tool to check a run away leader. Because of all the confrontation and interrelating decisions, the game is more enjoyable with three or four players – and should still be completed in no more than 90 minutes. Skagwayis fiddly for a worker-placement title. That, and its location-specific resolutions, leads to some clunky game flow until you’ve played several times. Even then, you’ll still be consulting the rulebook more than average. At least the rulebook is a good one. The other components are sturdy and functional, if not particularly jazzy. They’re standard fare for VP’s boxed games which are a big improvement over the old polybag bundles. You’ll need to wipe off the soot from the counter edges after punching them. I give them props though, because it takes some chops to list “charcoal desiccant packet” as one of the components. If you’re concerned with chrome, it’s not here. But overall, this one is priced at a good value. Some Prestige Buildings vary in points based on the town’s development. I personally like Victory Point’s low-key publishing philosophy, applaud their scope of titles, and have little issue with component quality (well, okay, except for maybe those puzzle boards). However, this one is very much under the radar, and I can’t help but wonder if a larger publisher or massive Kickstarter campaign would have generated more buzz for the title. However, that assessment could very well be wrong. On one hand, it’s a meaty, worker-placement game offering plenty of tough and meaningful choices. Yet on the other, it often takes chaotic and unpredictable swings based on how those choices interact, direct confrontation, luck, and some fun thematic crunch. Therefore, this could be a good bridge in a mixed gaming group. One part Eurogame and one part Ameritrash, Skagwayis an intriguing, genre-bending meld that’s hard to categorize, but will make a surprisingly fresh and unique addition to any collection. 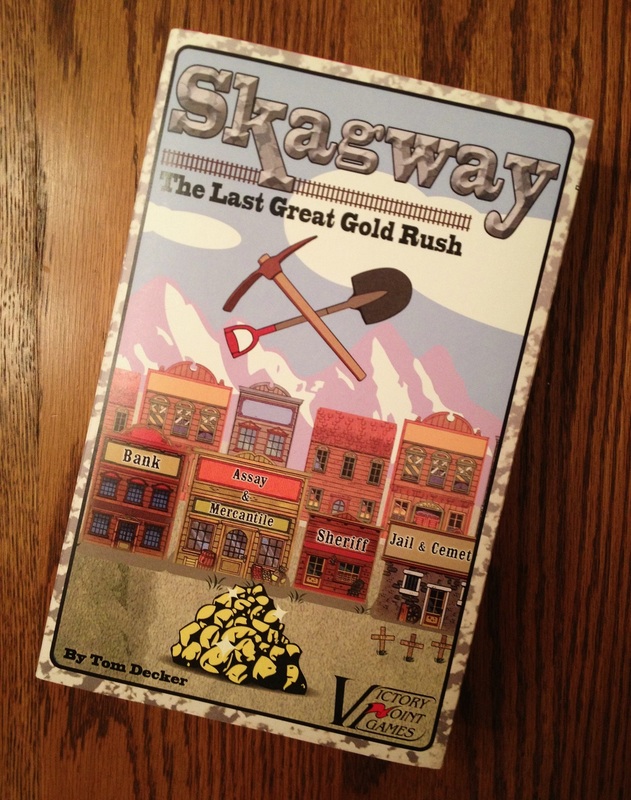 iSlaytheDragon would like to thank Victory Point Games for providing a review copy of Skagway. Previous ArticlePoint: Is Settlers of Catan a Worker Placement Game?